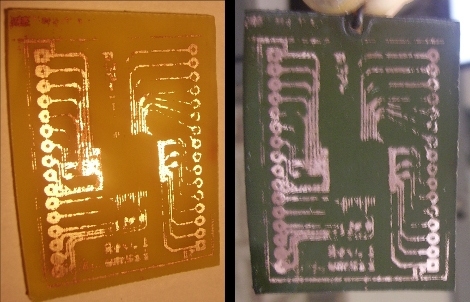 Tired of every printed circuit board you etch coming out brown? Take a page out of [Dane’s] book and dye your PCB to just about any color you want. One hour submerged in a 200 degree bath of Rit dye turned his brown FR4 substrate to the desired dark green. We give him points for being dangerous enough to use a broken bottle as a vessel, yet wearing eye protection at the same time. We never really thought of doing this, but it’s pretty interesting that it works. We’ve stained the substrate when removing etch resist so this should have been obvious, but wasn’t. Neat! I’ve seen these at the nearby grocery store as well. I think the local craft’s store even has an even larger range of colors. I do wonder how the PCB didn’t get whacked by the stir bar he said he was using. The same chick also has a vid on youtube showing the technique Dane used. Odd choice to go for a boring green, and I wonder how well other colors come out. Note for those not using the silly F: 200 ℉=93.3 ℃, so just below the boilingpoint of water. Before risking a board you have a lot of effort or money in- test the dye carefully for bad effects. Conductivity. Corrosion. Delamination. General Weirdness. I had a FMC Tire Balancer which often was malfunctioning from “Shop Crud” on it’s PCB. The secret repair method of washing that board with baby shampoo while scrubbing with a camel hair brush fixed it many times. The FMC factory tech warned us that *ANY* attempts at board coatings etc never failed to kill those boards! So careless board dying is a thinkable risk of your board dying. Small tip for those interested and not aware, you can use the same clothing dye to dye glass, including glasses you wear, I’m told. I say that because once you got into it and have the stuff in the house you might give that a shot too while you are at it. @Oren Beck: Good point as some dyes use metal salts to get their colors, particularly green (copper). Also, many years ago I saw that the legendary Bob Pease recommended running erratic and hard to troubleshoot boards through a dishwasher. Sure enough, that does help in a lot of cases. I will try different colors throughout the week thanks for the input. Yeah, its no solder mask, but when a prototype gets presented, its nice if it looks slightly more legitimate. I was very doubtful that fiberglass would absorb a dye so well. Could you please explain how someone who is making their own PCBs at home can add a solder resist layer? Having a good resist on the board is the ONLY reason I pay the outrageous prices for prototype boards, instead of just making them myself. I’ve never found any examples of a hobbyist making boards themselves at home that have a resist layer, and never found any explanations on how one can do it at home. Solder Mask it then !!!! and as long as your etch is good it will look identical to a pro produced board and completely legitimate just without the component indent (that just as easy to do but requires you to go through it twice). If you have the gear to photo expose and etch boards ,, then you have nearly all the gear to do a professional mask !! all you need extra is solder-mask ink , your PCB UV light box you already must have, and a silk screen, but a cheap alternative is net curtain stretched over an embroidery ring the developer is just caustic soda. you block print the board with your ink , dry it out in an oven ,, expose nothing but the pads then develop and where your pads are the mask drops away ,, bish bosh professional solder mask. Ink is about £30 for 2.5l + hardener (two part) and that’s the most expensive thing , but that will go a LONG LONG way ,, your unlikely to ever run out. Inks come in red (like sparkfun use) black , blue, yellow , white, and standard boring green. component indent is just as easy once you put on your solder mask , you just do the same over the top in white and use positive artwork. Use some Ormecon CSN7001 on your PCB before you mask it and you’ll also get a nice shiny highly solder-able Tin plate CSN7001 is a nanotin process ,, you dip your board in and a few seconds later you have a nice shiny nonotec tin surface. Sure I will put a tutorial up somewhere or if you like I can E-Mail you instructions. It really is VERY easy to do , but most homebrewers are scared by it thinking it is out of their reach ,, it isn’t its simple , same goes for tinning ,, real easy if you know the right stuff to use (CSN7001). Same as a lot are scared of SMT , which is easier than DIP once you get used to it. Only thing that i’d say is real hard for home-brewers like yourself is Through Hole Plating. I have THP equipment pro kit and its not cheap (chemicals alone are £420 a pop and they need replacing and replenishing) the lines are about £6000. Oooh I’m makin my next board in a nice red!! I think the community would really appreciate a tutorial that includes soldermask. Also, if you know of any other way to accomplish vias that doesn’t need thousands of (insert local currency here) to, that would be beneficial to add to such a tutorial. If you ever are able to put one together, email me at tycoinreno@yahoo.com, and make sure to sumbit it to hackaday so everyone can read it! @tyco iv never tried this but for the vias there is hollow copper wire that is used in thermostats for saunas(but unfortunately mercury filled) im sure you can buy it without the mercury then all you gota do it drill a hole slightly smaller then it (like a 32th or even 64th of a inch) and stick a piece in thats cut to length, but that way u prolly wont get a good connection until soldered. Actually, i’m kinda wondering if its possible to do the soldermask using just elmers glue and the soldermask paint. Elmers glue comes off with water and some light scrubbing. i’d imagine if you painted elmers over the pads you wanted visible, and just dunked the pcb in soldermask / paint, you could let it dry, soak it in water and the glued areas would dissolve away, leaving copper pads. it would be slow, as you would have to do it by hand, but for smaller boards it might just be a quick possibility. I shall attempt some tests once this boatload of coursework lets up. Grumpy Old Man Rule #1. Having had (past tense) long hair, when using a drill press of any size, wear a hair net. Otherwise, things could end badly. Forget about glue ect , just use the proper stuff , works out pennies(or cents) per PCB and its a lot easier than scrubbing and scraping. You can even roller it on with a hard foam roller but it gives a streaky horrible finish to you board still a perfect mask electrically just looks poor visually not like a pro board. use the net curtain trick and it will look like it came straight from a PCB house. There are manual THP alternatives that work well but aren’t much use on high density boards and are very time consuming to do. if you use the right ones (not the Pin type) you can via underneath TQFP packages with them no solder required. Mav, how are you doing your through-hole plating? I bought an electroless nickel kit a while back but didn’t have good results, and you still have to fill the holes with something to get them to plate. When I was in the Coast Guard we had a PCB repair kit that had these little hollow tubes and a flaring tool that let you repair vias. I have never been able to find a place to buy those though. On my boards I’m just adding vias in Eagle and then soldering trimmed component leads into the holes, but I’d like to not have to do this. I also hate not being able to use the top layer pads for traces on through-hole components like connectors. I don’t believe that will work being an owner of some two part soldermask. First of all this stuff is very thick so you cant just paint it on it has to be applied with a silkscreen (I picked up a metal framed silkscreen for a yudu machine at Michaels for around $20) Anyway there is no need to do this because all you have to do is uv expose (with a transparency) the soldermask and then put it in draincleaner and the soldermask over the pads just disappears. The hollow tubes you describe are exactly what I am referring to as the manual approach , minimum via size is 0.8mm i think which is huge on the grand scale of things (I often go down to 0.1mm). You can still get them , both Mega electronics and LPKF do these type of manual THP. The Ink is quite thick as Awesomenesser says , but it can be thinned if required. thinner is product code 41-ZE577 a little down the list. I see someone posted my old video up at the top there, so I thought I’d update you with the new technique I’m using. We’ve got a forum attached to our website too if anyone wants to see more pictures or ask any questions.